Construction is under way, more than 200 affordable housing and mixed-income residential units are taking shape within 70 row houses as part of Home Leasing’s $47.8 million project in the Arbor Hill neighborhood and along Clinton Avenue and Ten Broeck Triangle. 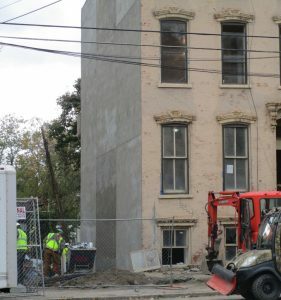 Each building is undergoing a gut rehab, Home Leasing is completing approximately three buildings per month and completion is planned for late 2020. One of All Over Albany’s final stories details the project here. The new investment is building a connection between downtown and its surrounding neighborhoods, an Impact Downtown Albany plan priority. A project made possible with City of Albany industrial Development Agency assistance, the scattered-site undertaking involves the revitalization of 210 units within 70 row houses and 2 vacant parcels. Approximately half of the units are vacant, with eight of the buildings condemned. Learn more.